So Recently I decided to purchase a Vancouver Canucks Salmon Alternate to try and get some nameplates as NOBODY has the correct Red Dye Sublimated Air-knit that was used for this style. Anyways, After sacrificing a replica to get an exact match what I have is very few nameplates as the majority of the alt jersey was black and multicolored Air-knit. The plates are 4.5 tall and vary in length. I have up to 16" long if need be. It's $20 shipped per plate (Canada or USA) which is somewhat steep for a nameplate, but you can't get these without cutting a replicamup as nobody can match the color and material, and as we all know the replica prices are THROUGH THE ROOF for this style and somewhat of a waste to ruin. I only have a limited number of them so if you want a specific length please PM me! Anything under 16" I will have. ALSO NOTE, These are hand cut to allow for minor trimming or serging and do not have "finished/serged" edges. That being said, they are all cut evenly and clean edged and could be applied directly without sergeing if you desire. Cut some more plates and have quite long ones that would work for "MOGILNY" "TIKKANEN" "NASLUND" etc... Longest I beliebe is 4.5" X 16" which would allow for an 8-10 letter name depending on the width of the letters in the name. Can also provide shorter plates if requested. It's CCM Dye Sublimated Air-knit cut directly from the jersey which provides an exact match to your jersey. Screwed over 2 members - buyers beware. Mods, feel free to pin this if you wish to save space and help other fulfill their individual requests. To get caught up on a few jersey projects, I thought I'd post a few of the Nameplates I'm searching for here to see if any forum members have any laying around. St Louis Blues EDGE home. Pm me if you have any of these please! I've gone ahead and pinned this thread. Let's try and keep all nameplate requests in this thread going forward. Thanks. Sorry, this is totally NOT trying to piggyback, but I thought an already existing nameplate designated post was a better place to put this instead of making another post. Maybe if the mods agree since this seems to be a pretty common request we can pin a Nameplate thread, list what we have and what we want, and then members can prevent the crazy upselling prices we get stuck with from Cresting Companies who either won't sell, or severely mark up a blank nameplate. RED CCM airknit (Montreal Canadiens, Detroit Red Wings shade is great) = Need 1 Smaller Nameplate. All my plates I offer are cut from Real Genuine Jerseys that for whatever reason have been salvaged for parts or were beyond repair. I'm never trying to get Rich off of these, just sell them for the cost of shipping in most cases so I'm at $5.00 a Pop. Sorry to Selanne8 for Hijacking, but hopefully this helps us all! For the mustard yellow, the only place I know for sure has it is EPS, meaning you would have to order a full kit. Always looking for nameplates in both Blue and White for Rangers Edge jersey with the correct curve, though I'm sure those are impossible to get without going through a company. White nameplate for a 1998 Nike Team USA Olympic jersey. Blue and Yellow nameplates for 2004 Nike Team Sweden jerseys. Teal nameplate (ultrafil?) for 1994 NHL Eastern Conference All Star Jersey. Need black CCM Ultrafil nameplates. Good idea starting a nameplate thread. And should soon have some blue nords and orange flyers...will update. 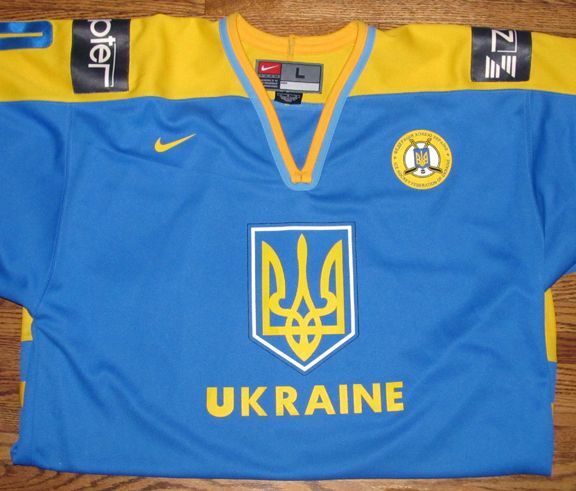 I dare anyone to come up with a nameplate for my Ukraine jersey. it's a Nike, but at this point fabric is very, very secondary to the correct shade of light blue. As long as I'm dreaming, the name on the back will be Shakhraychuk, so the plate needs to be 1/4 mile long. 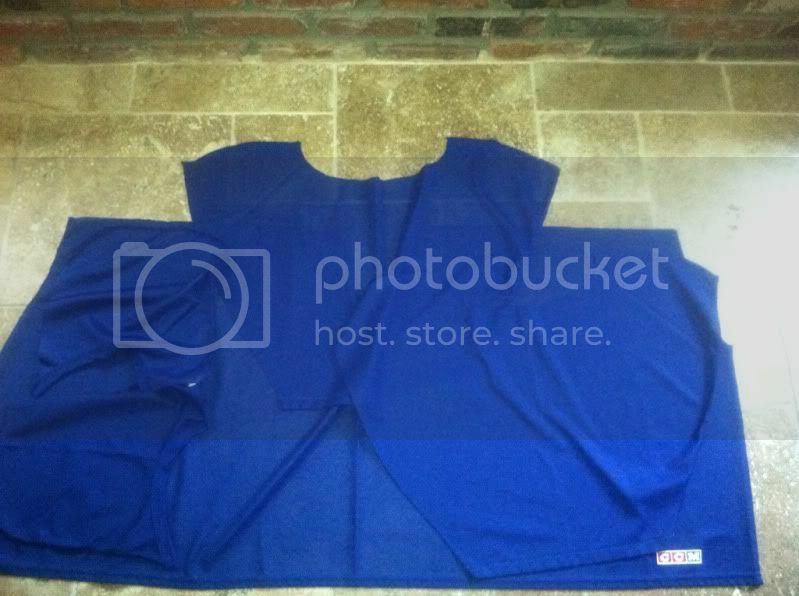 I have a bunch of blue ultrafil already, I need white. What brand of orange Flyers? I have heard the Nike is tough to find, so if you have one of those, I will take one. I have white ultrafil nameplates. $5 shipped to Canada, $6 to the US. which part of the jersey? Think air-knit would make that much of a difference on a black jersey? Ones an edge 1.0 the other a 2.0? Looking for a 7 letter nameplate for an 06/07 Dallas Stars jersey. 1 maroon and 1 white starter mesh plate long enough for "ROY"
Or if anyone else here has a need for starter mesh maroon plates, I'd be willing to cut up my authentic to sell for nameplates if enough people need it. I sent a pm! I have something that might work!